y posing for his mother's oil paintings and helping his father build furniture, Guruhans Kroesen learned about structure, composition and creativity  which later helped his own artistic endeavors. With parents who moved about seemingly at random, Guruhans went from New Hampshire to New Mexico, Kansas, Washington, D.C. and Virginia before landing in Portland. Translating an image from the mind of Guruhans Kroesen to a 3-D steel-and-stone sculpture is a demanding process. "Once the idea is established, I have to design the multiple facets of the sculpture, like the different sides or a particular joint," he said. "I usually start by drafting on cardboard to get the lines just right. I can't stand a line with any dead spots or incongruities." Craftmanship is particularly important to Guruhans. "I want my work to have a finished quality," he said. "It must be immaculate. This is something that was brought about by looking at Constantine Brancusi's sculpture." Inspired by the beauty he sees in nature, Guruhans aspires to perfectly depict the viewer's relationship with it. "Also, anything that attempts to put symbolism to divinity interests me," he said. "I'm intrigued with infusing metaphysical concepts into my work, using shape and form to create a sense of purpose and meaning." The worst thing Guruhans can imagine is a society that erases its artists. "With funding being cut and schools closing art departments, I encourage everyone to support the arts in some fashion  whether that's attending ballet, art shows, concerts, etc. ; anything that is creative and grassroots. "It's those things that create culture," he said. "Why do so many people travel to France or Italy? For the art." When Guruhans was eight, his parents, through the influence of their spiritual teacher, sent him and his brother to India. "I spent eight years at a boarding school in the town of Mussoorie in the foothills of the Himalayas," he said. Guruhans believes the experience helped bring out his artistic nature through his interactions with colors, forms and culture. After returning to America, Guruhans finished high school at the New Mexico Military Institute in Roswell. Then he came to Portland to attend Portland State University. "In school I was always interested in design, but never got anything built," he said. "I tried architecture but fell into the same trap. So sculpture was the way to design and build with little need for outside support. "I tend to be impatient and want a design to translate from the idea stage to reality as soon as possible, with the outcome being exactly as I envisioned." That's the hard part for Guruhans. Dreaming about sculpture is easy; he can think of thousands of designs every day. But actually building the pieces is where the patience and practice come in. 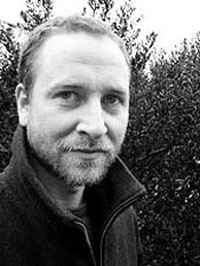 "Attending the university introduced me to the structured art world and its possibilities or limitations," he said. "It was a good launch pad for me and influenced how I decided to pursue the arts." The excitement of art is what keeps Guruhans sculpting, and being able to create whatever he dreams up fascinates him. Guruhans' work is on display every Last Thursday at the 1627 Studios on Northeast Alberta. 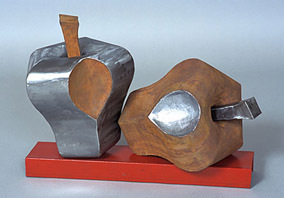 His sculptures are also showing at the Brian Marki Gallery and Contemporary Crafts Museum & Gallery in Portland. 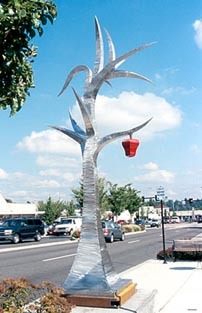 Last year his sculpture, "Dream," was part of the City of Lake Oswego's downtown arts exhibit. "Many people dream of societal ideals, a big house, nice car, lots of cash," he said. "I dream of making art, of creating a new expression in the world  original and big. "I love monumental art. I aspire to make sculpture on a par with the St. Louis Arch or Washington Monument," he said. 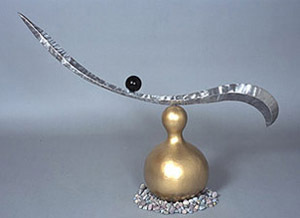 E-mail Guruhans at sculpture@guruhans.com, and check out his Web site. You can reach Kathy at kanderson138@comcast.net, and draw on other Sketch Pads.